Microsoft's augmented-reality computer, HoloLens allows its users to spot mistakes ahead of time, rather than make workers correct the mistakes as they happen. This is brilliant technology for the construction industry. The HoloLens, works by placing a holographic image in the user's physical space which in turn helps increase efficiency on time by allowing the users to spot those mistakes and helps stop budgets from running over. As with any new technology Microsoft will need to examine all construction working environments, as having a set of goggles obstructing your vision could prove dangerous on any building site. The main question is, will we find more engineering firms embracing this technology or will they see it as just a new toy? Employees at Gilbane Building Company, a commercial construction firm based in Rhode Island, usually work off paper blueprints or with digital models that they view on computers or iPads. But Gilbane senior manager John Myers now gets a closer look by putting Microsoft’s augmented-reality computer, HoloLens, on his head. 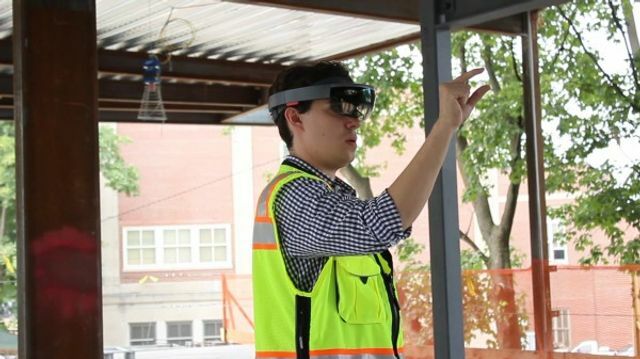 When Myers recently put on HoloLens to look at a mockup of a project, he could see that steel frames the company planned to order to support the building’s walls were too long to fit the design. Having spotted the issue ahead of time, the company can now ask the supplier to cut the frames shorter in his shop rather than make workers adjust dozens of tracks that would hold the frames in place. Myers estimates that the move will save Gilbane about $5,000 in labor costs.